The girl is Hana, my niece, seven years old. 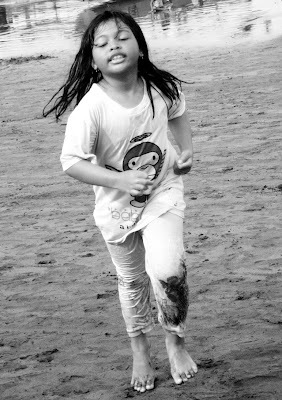 My husband, Rofi, captured her on Pangandaran Beach (Ciamis, West Java, Indonesia) a few days ago. It’s a pity that I can’t join them (my husband and my SIL family) playing on the beach. Oh, she's having such a good time! Good shot by hubby of a potential Olympic runner! that is one gorgeous shot Lina....nice one...too bad you were not there....lol! Lovely capture. She is a pretty girl.